THE other day an invitation card from the Ghalib Institute, New Delhi, had it that a special programme would be organised on June 12 to felicitate the doyen of Urdu literature Kashmiri Lal Zakir on the occasion of his 90th birthday (it actually fell on April 7). The April 2009 issue of Alami Urdu Adab, devoted to the life and works of the well-known literary genius, would also be released on the occasion, the invitation said. That the journal that claims to be the most serious recorder of literary achievements of those writing in Urdu anywhere in the world should wait for Zakir to complete the ninetieth year of his life’s journey to do what it has done is surprising. He deserved this treatment much earlier. It was also both heartening and surprising to hear at the function that the Haryana Government had decided to honour Zakir with Fakhr-e-Haryana (the Pride of Haryana). Why so late when he has made an enormous contribution to the literary growth of the state through his association with the Haryana Urdu Akademi as its Secretary since 1987? Haryana today finds a highly respectable mention in the annals of Urdu language and literature mainly because of the concerted efforts of Zakir. In a way, the state has honoured itself by declaring Zakir Fakhr-e-Haryana. It will, however, be unfair to confine Zakir to any particular state or region. In fact, he deserves to be called Fakhr-e-Urdu (the Pride of Urdu), the language that was born in the area that is now called Haryana. Zakir has his readers not only in India and Pakistan, but also in West Asia, Europe and the US where those who know Urdu keep waiting for his new work. He began his literary odyssey in the early forties with the publication of his first ghazal in Adabi Duniya of Lahore. 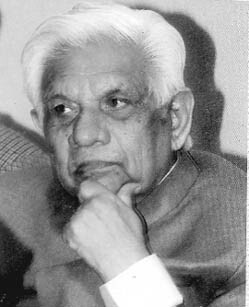 He joined the galaxy of respected short story writers in 1943 with his contribution first appearing in Humayun magazine when he was hardly 24. Humayun was one of the prestigious publications of Lahore, and it was not easy to get one’s work carried in it. It had given a lucky break to such literary geniuses as Krishan Chander, Saadat Hasan Manto, Rajinder Bedi and Upendranath Ashk. Young Zakir had to struggle hard to see his name in print in Humayun. As he confesses, he wrote and destroyed more than two dozen short stories to finally get one selected for publication in Humayun. This gave him a big boost and his literary journey continued unhindered. In 1955 he came out with his first novel, Sindur ki Raakh, published by Maktaba Shahrah, Delhi. Today he has a long list of literary achievements, including ghazals, short stories, novels, travelogues, dramas and awards. But Zakir shows no signs of having got tired. He has as much zest for life as can be seen in a promising youngster. His Akhiri Adhyaya, which highlights the agony of AIDS patients, is his latest and 29th full-length novel. He is busy with many other such projects despite his onerous responsibility of looking after the Haryana Urdu Akademi. His affair with writing has been so intimate that he has always been spending much of his time on literary pursuits. That may be the reason why he refused to listen to his family members and others to get married again after his wife died when Zakir was not even 40. He continued to create literature even when he had been as employee of undivided Punjab’s Education Department for over 30 years. The Haryana Urdu Akademi was lucky to have got Zakir to preside over its affairs soon after it was set up. Very few people knew it in the beginning. But now it is one of the top institutions engaged in promoting Urdu, thanks to the efforts of Zakir.